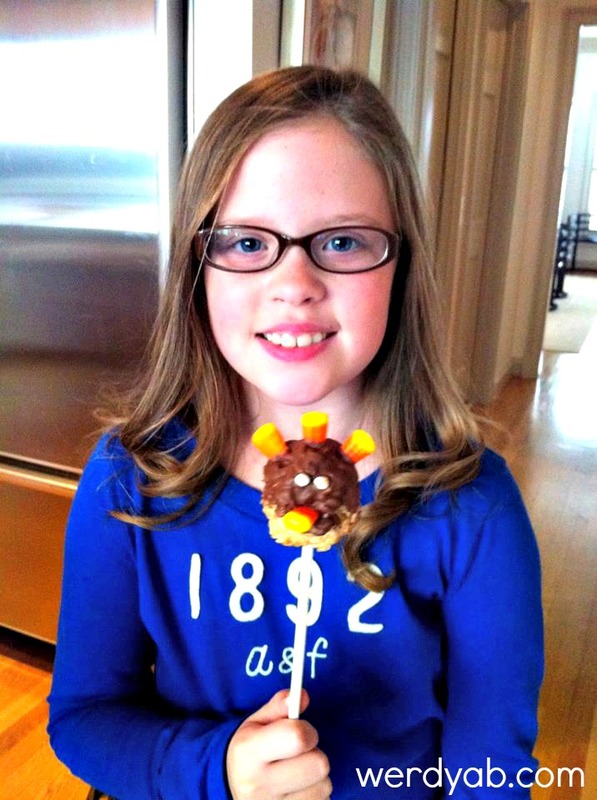 My daughter Bailey and I made turkey pops last year for our family's Thanksgiving dinner. They were a hit and so easy to make! Gluten free, too. In a large saucepan, melt butter over low heat. Add marshmallows and stir until completely melted. Once melted, remove from heat. Add the Rice Krispies cereal and stir until coated. Using a 1/4 measuring cup well coated with non-stick cooking spray, divide the mixture into 24 sections. Using buttered hands, shape each section into a ball. Place on a wax paper lined baking sheet and refrigerate about 10 minutes or until firm. Combine chocolate morsels and oil in a microwave safe bowl and microwave on high for 1 to 1 1/2 minutes or until smooth, stirring every 30 seconds. Dip each ball into the chocolate allowing excess to drip off. Place back on the wax paper lined baking sheet. Refrigerate 5 to 10 minutes, or until chocolate is almost set. 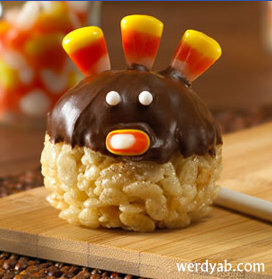 Using candy corns, decorate your turkey pop, adding feathers and a beak, gently pressing candy into mixture. Press in small white pieces of candy for eyes. Add sticks to serve as pops or serve as turkey balls on a platter. And voilà! A cute dessert that adults and kids love! And Pinterest will be so proud of you. Seriously, everybody gets a victory lap here. Happy Thanksgiving!